Decades before NASA existed, Langley Research Center studied the challenges of flight, a mission that prepared the United States for the space race and modern astronaut exploration. Researchers at the center helped design a plane to break the sound barrier, plotted how to put humans in orbit and then stay in contact, hunted where the first lunar astronauts should take their first steps on the moon, and then trained those astronauts in simulated gravity. The center went on to help develop the space shuttle, built and maintained satellites to study Earth, and is currently working on the Space Launch System, an advanced vehicle that will one day allow humans to travel into deep space. The Langley research lab is located in Hampton, Virginia, only a few miles from Virginia Beach. Its Air & Space Center serves as the official visitors center, and contains a wealth of aircraft and spacecraft exhibits. An aerial view of NASA's Langley Research Center in Hampton, Virginia. Langley Memorial Aeronautical Laboratory started in 1917, months after the United States entered World War I. The center's original focus was on airplane technology, with a goal "to solve the fundamentals of flight," according to Langley staffer Jim Schulz in an article about the center's history. The agency made groundbreaking aeronautical advances, including better propellers and new kinds of rotorcraft and helicopters. During World War II, planes like the P-51 Mustang were tested in the United States' first wind tunnel built for full-sized aircraft. The research helped engineers to reduce fuel use and increase wind speeds, a combination that "helped win the war," Schulz wrote. But wartime wasn't the only time Langley worked on planes. The center helped to design the Bell X-1, an experimental aircraft that then-Air Force Captain Chuck Yeagerwould use to break the speed of sound. Langley would continue researching hypersonic aircraft, helping to design the X-15 that flew five times faster than the speed of sound by 1959. "Data gathered during the X-15 flights would directly contribute to the creation of the U.S. space program," Schulz wrote. Only days after NASA was founded, the Space Task Group (STG) was established to help get humans into space. Many members of STG were drawn from Langley's ranks, where the unit would work as a field unit. 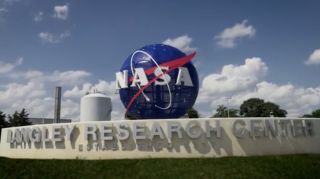 "Though Langley lacked management control over the new group, the center's support of the task group's ambitious program proved remarkably strong," James R. Hansen said in his book, "Spaceflight Revolution," part of a NASA history series. Some of these gentlemen were not at all enthusiastic about our plan to put a man into space," Gilruth later acknowledged. In fact, Presidential Science Adviser Dr. George Kistiakowsky had remarked with great displeasure that the plan "would be only the most expensive funeral man has ever had. Nonetheless, the STG engineers launched test rockets with dummy payloads that fell back into the nearby Atlantic Ocean, checked and rechecked Mercury escape rocket and recovery systems, sent two Rhesus monkeys into space to better understand the risk to astronauts, and helped to develop the heat shield that would protect the space travelers when they re-entered Earth's atmosphere. Gilruth later said that Project Mercury "wasn't pretty like a flower or a tree. But it had no bad traits. It was designed as a vehicle for a man to ride in, and circle the earth. With its blunt body, its retrorockets and parachutes, it was an elegant solution to the problem." The physicians were "horrified at the casualness" of one suggestion that in-flight communications with the astronauts could be handled like commercial air traffic control, with the pilot only reporting to the ground every 15 to 30 minutes. The doctors, intent on continuous and complete monitoring of the astronaut's vital physiological and mental responses to the unknown demands of spaceflight, did not like the idea of gaps in communication lasting for any appreciable length of time. Ultimately, STG opted to set up a tracking network with no gaps larger than 10 minutes. In a time when instantaneous phone calls were not yet possible, NASA needed to build up a global system. With STG already swamped with their duties, Gilruth asked if Langley could take on the additional responsibility. The agency stepped up to the challenge, overseeing the creation of an ambitious network made up of 18 relay stations across three continents, seven islands, and two ocean-bound ships. On May 5, 1961, Alan Shepard became the first American to fly a Mercury capsule, Freedom 7, into space. On the third Mercury mission, aboard Friendship 7, John Glenn became the first American to orbit the Earth. While the astronauts took center stage, Langley's human "computers" performed backup calculations to keep them safe. Originally hired during World War II to make calculations about airplane safety and rocket-launch experiments, the computers were mostly women, and included minorities. As a part of the preflight checklist, Glenn asked engineers to "get the girl" — Johnson — to run the same numbers through the same equations that had been programmed into the computer, but by hand, on her desktop mechanical calculating machine. "If she says they're good," Johnson remembers Glenn saying, "then I'm ready to go." In 1962, STG moved to the newly built Johnson Space Center in Houston, Texas. But this didn't mark the end of Langley's role in space exploration. The center continued to play a role in the trip to the moon, from the lunar capsule to touching down to astronaut training. Familiar with aircraft, Langley helped to design and manage the Lunar Orbiter project, which photographed almost the entire surface of the moon. These photographs helped determine where Neil Armstrong and his crew would eventually take their first lunar steps for humanity. Langley was also home to aerospace engineer John Houbolt, who contributed to the design of smaller, simpler lunar modules for the landing crew. Langley also housed the Rendezvous Docking Simulator, where astronauts practiced the procedures necessary for a lunar landing. While astronauts today spend most of their training time at Johnson, the first potential lunar astronauts spent their time at Langley. The Reduced Gravity Simulator was a vehicle suspended by a network of cables to an overhead track. Here, astronauts would test their ability to walk, run, and perform various tasks under reduced gravity. According to NASA, "Armstrong offered what was perhaps the greatest tribute to the importance of his Langley training in Apollo 11's success. When asked what it was like to land on the moon, he replied, 'Like Langley.'" Two mechanics pose near the entrance of Langley's first wind tunnel. Langley continued its groundbreaking work long after Armstrong and his crew completed their first journey. Langley evaluated designs for the space shuttle that served as NASA's main human transportation system for more than three decades. The center also improved materials and tested landing systems crucial to all 135 shuttle missions. Langley engineers created, built, and managed a series of aircraft on board planes and spacecraft to study the planet's changing climate. The lab led the first successful mission to Mars with the 1976 touchdown of Viking 1. Advanced sensors in the heat shield of the 2012 Mars Curiosity Rover came from Langley's labs. Today, Langley is hard at work on the next generation of rockets, the Space Launch System. The SLS is a powerful rocket designed to reduce the amount of time it takes to travel through space, reducing trip times to the outer part of the solar system. Carried into space by the SLS, the Orion spacecraft will be capable of carrying four astronauts out of Earth's atmosphere, to the moon, Mars or elsewhere. The first test is planned for 2019.